Have you ever driven around aimlessly not knowing what or where to eat? That happened to me yesterday. rif and I couldn’t decide on what to have for lunch, so I quickly took out my notepad and flipped to my eat list. 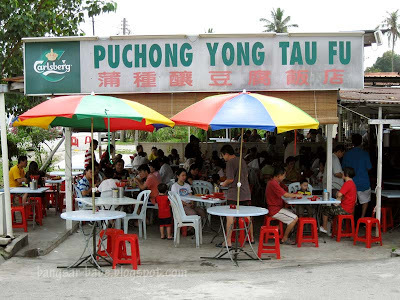 Puchong Yong Tau Fu was scribbled at the bottom corner of the page. Famished, we quickly agreed on that. 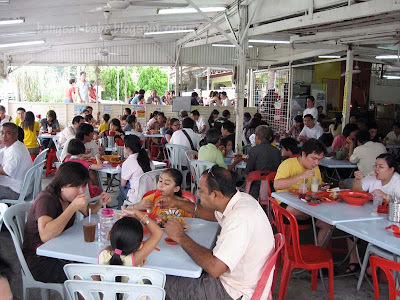 The shop is opposite the Puchong Secondary School and SRJK (C) Han Ming in Batu 14. Good thing we arrived before 12noon, as the place was already 80% full. At lunch time, people were crowding around us looking for a place to sit. The place is no-frills, with zinc roof and no air conditioning. It was quite hot in the afternoon (no, the ceiling fans didn’t help much)— good thing we were dressed appropriately. rif secured us a table, while I went to choose the yong tau fu. Unlike most shops I’ve been to, this yong tau fu is made on the spot. 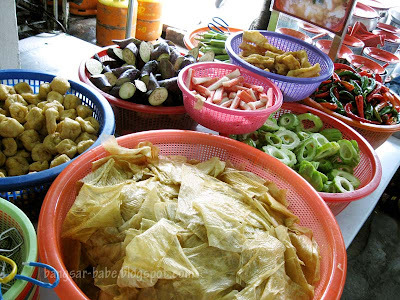 First, you select the items you want (brinjal, okra, chili, bittergourd, yau char kwai, crabstick, fuchuk, and taufupok), and place them in the basket. 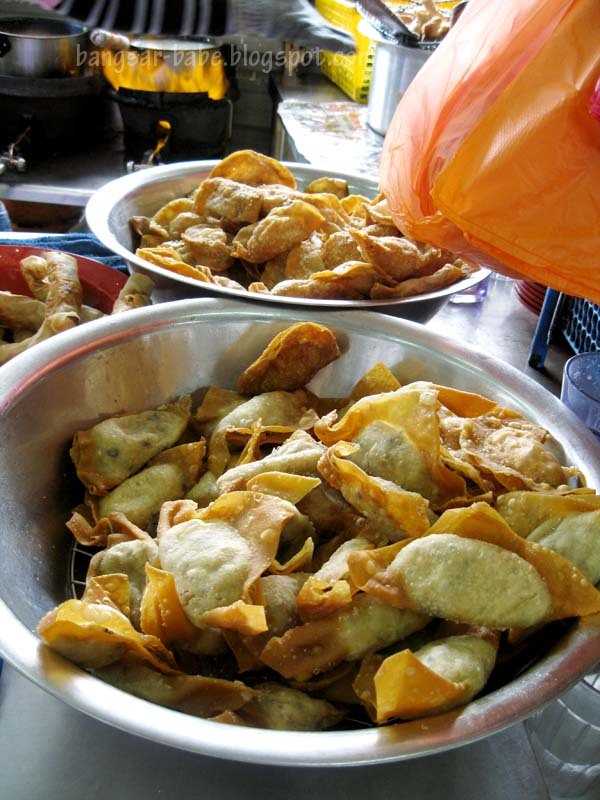 Bring the basket to the staff, and they will ask you if you want any other items — I ordered their homemade fish balls, fried wantans and sui kows. Your selected items will be stuffed with fish paste and then deep fried or boiled. 15 minutes later, our yong tau fu arrived, piping hot (don’t pop it all at one go, you might scald your tongue) and fragrant. We especially loved the stuffed yau char kwai. Very moreish, and I regretted not ordering more. 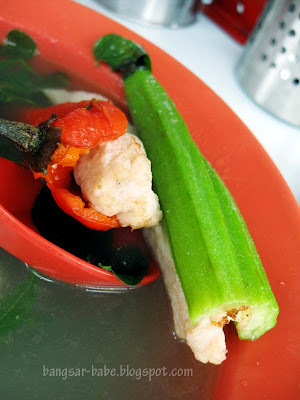 They were quite generous with the fish paste filling, which was bursting out of the vegetables. The fried sui kow and wantan were decent, but I found the skin a tad hard. Did I mention the chilli sauce was good? This was one of the better ones I’ve had, and it went very well with the yong tau fu. 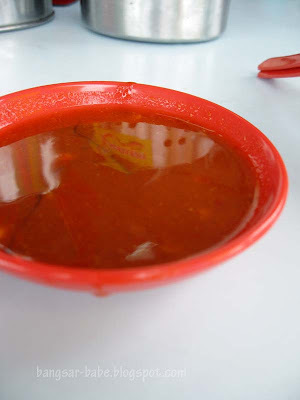 The chilli sauce was spicy and slightly tangy, with chunks of garlic inside. The fish paste filling was springy and firm, and it didn’t taste like they added baking powder or soda bicarbonate to make it bouncy. Utterly addictive! The rest of the yong tau fus came in a bowl of soup with leafy vegetables. It was quite good, and didn’t reek of MSG. 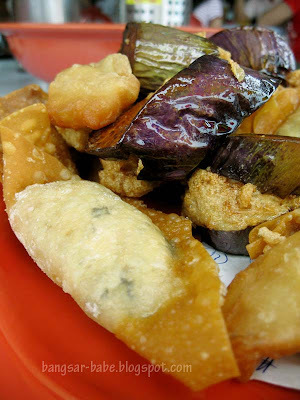 Each yong tau fu costs RM1, which I thought was fair, judging by the bigger cuts of vegetables and generous filling. Overall, I liked the food and didn’t feel thirsty after the meal. I would definitely be coming back for more. 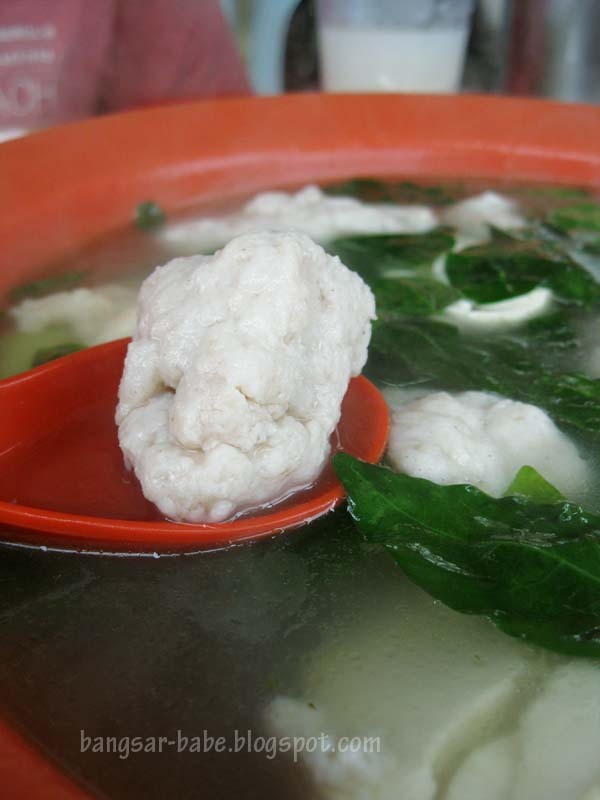 Verdict: If you want fresh and tasty yong tau fu, try this. 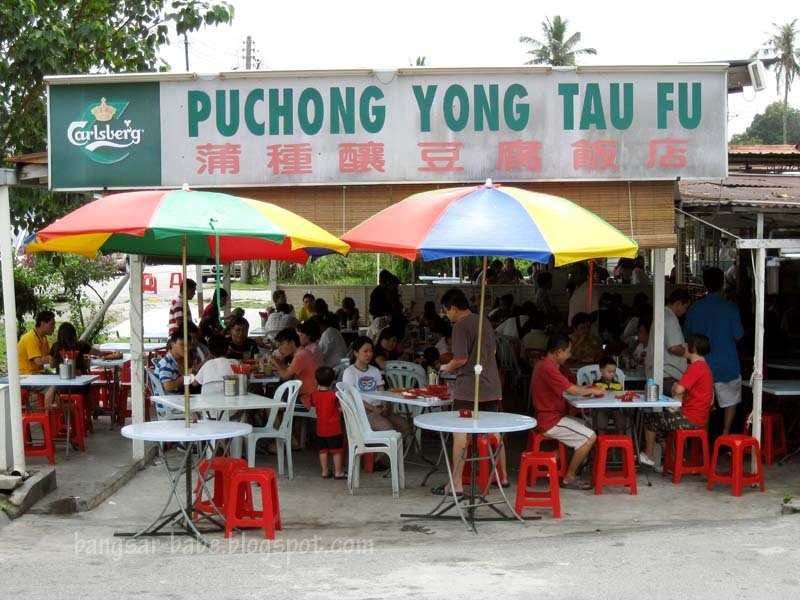 One of my fav yong tao fu place. I heard there are two stalls there. Last time used to be one, the sisters run the place together but then some argument between them and then they split. 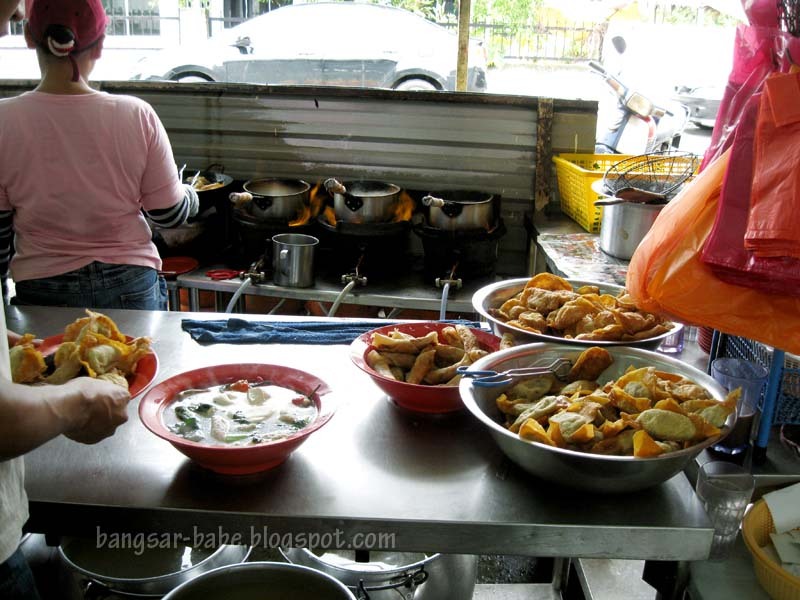 Yeah, this is my fave YTF joint in Puchong! Didn't know they have added crabstick to their selection! wow! finally a YTF plc that serves bouncy, fishy fish paste! Not flourish ones! sounds good enough from your review. not some place i would go back unless they giv me aircon, its like a furnace there la!..everything is XXL there though, value for money? 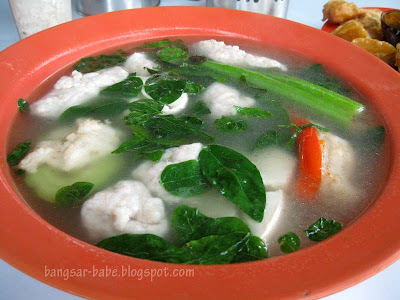 the fish stock soup is tasty and the sayur manis is my fave. ai wei – Yup, it's quite tasty! foodbin – I don't care much for the sayur manis, but the soup was good. Cumi & Ciki – Yup, come we go there again! 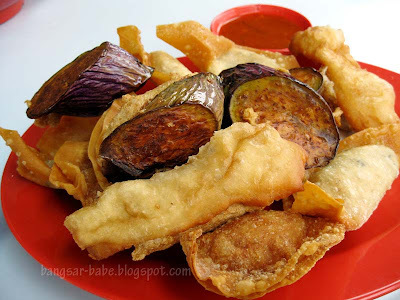 Joe – Wear singlet la! PureGlutton – Yup, but I didn't try that. you might want to try original Ampang YTF near flamingo hotel.